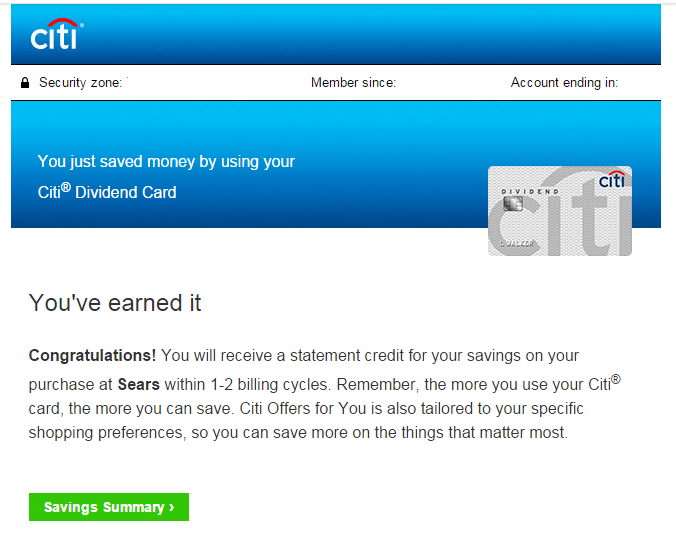 Citi starts a new reward program, and one of my credit cards (Citi Dividend) is eligible. It’s called Citi Smart Savings. It’s like Amex Offer. You will earn a certain amount of statement credit when you use the card at a merchant specified by each offer. For starters, there are five offers available for my credit card. 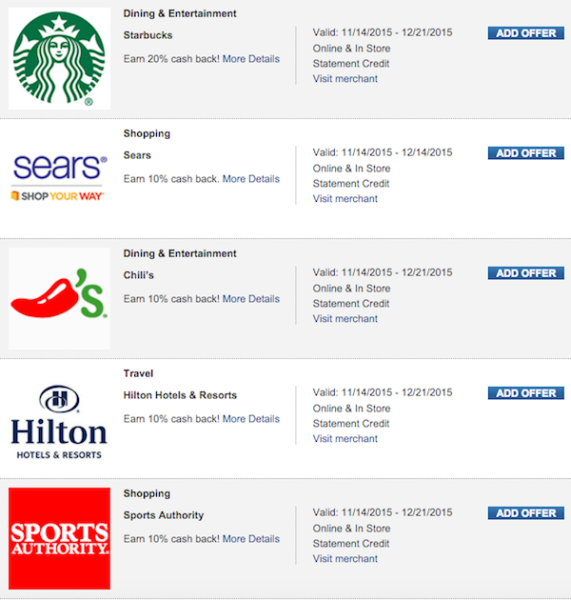 Except for Starbucks, the offers are identical to my BankAmeri Deals and PayPal Prepaid Payback Rewards. 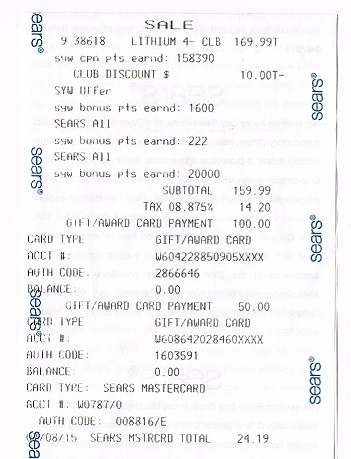 I believe Sears’ offer is great for most people because they sell Visa gift cards. $200 Visa gift cards are sold with $6.95 purchase fee. When you buy two VGCs, you can make a profit, $35.00-$6.95*2=$21.10! A type of reward is statement credit, not cash back or Dividend Dollars. So, it doesn’t count towards the $300-cashback-annual limit. Like other rewards programs, you need to add the offer you want before using the cards. I already bought VGCs. Just like Amex Offer, a confirmation email was sent right after the transaction. Starbucks offer appears great, but it only offers $4 max. To redeem this offer, I set up Auto-Reload as terms stated. For this offer, it took a little while, but I received a confirmation email as well. I think I can cancel Auto-Reload now, but I will leave it for a week just in case. I hope more and more offers will be available soon. So, you need to make three transactions of at least $50 to earn the statement credit. There is no restriction, such as “PayPal transactions are excluded.” So, eBay, online, in-store purchases, all transactions will be eligible for this promotion. It has to be activated by click a link in an email as usual. You should activate and make eligible purchases by 08/31/2015. Costco doesn’t accept MasterCard credit cards in-store but does accept online. If I make online purchases of three $50 Costco gift cards and then use them in-store, it’s like 20% discount on the next $150 purchase at Costco. Since I still have time to redeem, I will try to come up with a new approach to take advantage of this offer. I enrolled in Discover’s “Double All Cash Back” promotion last month. It’s a great promo they literally double all cash back you earn for twelve statement cycle. My promotion started on 6/12. Since then, I’ve been using their shopping portal (Discover Deals) more often. And it will be no problem to earn a full of Q3 category bonus. The bonus offers cash back for up to $1500 spent at home improvement, department stores, or amazon.com. I regularly spend more than $1500 at home improvement stores. Even if I don’t spend that much, I can buy third-party GCs at Lowes or VGCs at Sears to get a full of category bonus. Last Quarter, however, wasn’t easy to earn. Q2 category bonus was restaurant and movie. First of all, I don’t spend very much on these categories. Second, if I seriously wanted to save more money, I would have bought GCs from GCs resellers with more discount. There are 10% or even 20+% off GCs for restaurants and movies. Thus, I used my Discover card only a few times at restaurants when I enrolled in “Double All Cash Back” promotion. The promotion will give you another 5% cash back. So, I thought there might be a way to earn a full of bonus cash back effectively. After some research, I found Fandango might be used for this purpose. And I bought $50 e-gift card as a test. I made some mistakes. I assume that Save ya accepts Fandango e-gift cards, but they don’t. And I couldn’t tell from recent activity at Discover website whether or not cash back would post. But I thought cash back from DD would most likely post because I received a confirmation email. So, I bought five $100 physical GCs. Since physical GCs took longer to arrive than I expected, I couldn’t buy more GCs in Q2. Now that statement closed, I can see the result. I spent $559.75 in total. Shipping cost and purchase fee ($9.75) is not eligible for cash back of DD. $55 came from $550 spent. It’s easy to confirm. As for 5% category bonus, $28.07*0.05=$27.99. It posted a little more because I spent a few dollars at a coffee shop. So, both of 5% category bonus and DD have been posted without a problem. Lastly, It’s off-topic, but I wonder why they still use SHOPDISCOVER for some merchants in a statement while some of them are written as DDEALS in a statement. The item for VIP Choice Benefit coupon is eligible for 5% discount. Here is a screenshot of an online transaction of the final step. As you see, you will get $8.50 discount. You can go ahead and pay with gift cards. The discount won’t disappear. The problem is that my account is blocked from online orders. So, I need to go to the store to use this coupon. I bring gift cards and the credit card to the store. And then I pay with gift cards for the most of the charge and pay with the credit card for the rest. I bought (1) $100 GC and (2) $50 GCs, total $200 in case the price was higher than the online price. I didn’t get 5% discount. An instant discount of $10 is from Craftsman Club. 1600 pts is a base point. 222 pts is Sears credit card bonus. (Extra 1% point. excluding tax.). And 158390 pts is from VIP Choice Benefit coupon. (158390+1600=15990, 100% back in points) I don’t know about 20,000 pts. I think some coupon was automatically loaded and redeemed. What should I do to apply 5% discount? This time it wasn’t successful, but the other day, it worked. At that time, I was asked “How would you like to pay?” and I said, “Sears credit card, but I’d like to redeem all SYWR points I have.” Then a clerk pressed a key on a register and continued to check out. But I turned out that I had enough points to cover a whole expense. And a receipt was printed out without using the credit card and showed 5% discount applied. Have a certain key on a register pressed by a cashier? That’s it? Have a certain key on a register pressed by a cashier and pay a WHOLE payment with either GCs or SYWR points? Multiple coupons and discount caused the discount wasn’t applied? As for online orders, they are always successful. It doesn’t matter if you pay GCs or SYWR points, fully or partially. 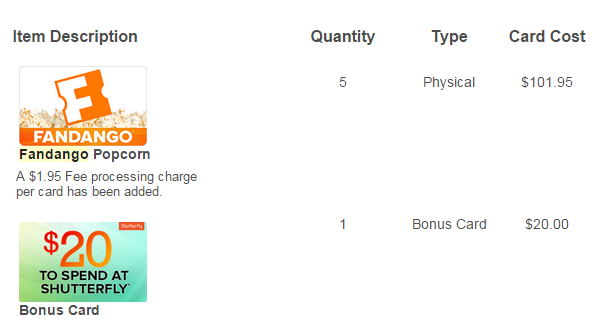 Since my account is blocked from making online orders, I need to go to the store to redeem the points I just earned. I will try another approach to get the discount then. 2nd quarter of Discover will end in 10 days. I don’t spend much on these categories (restaurants and movies), and usually, these GCs can be purchased from GC resellers with more than 5% discount. So, I hadn’t even tried anything to earn bonus rewards until I enrolled in Double All Cash Back promotion. Now, a category bonus reward is 10% cash back. Although there is not much time left, I tried to find a way to earn Q2 category bonus reward. As a test, I bought $50 e-gift card. A category of the transaction is Travel/Entertainment. I don’t know if it’s eligible for Q2 category bonus. 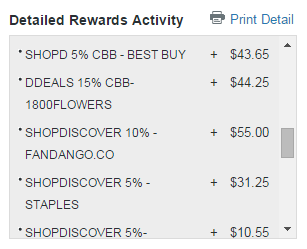 As for Discover Deals, I received a cashback confirmation email a few days after the transaction. Hopefully, both category bonus and Discover Deals cash back will be posted and then doubled. When everything goes well, I can make a profit by buying and selling gift cards. Physical or Electrical Gift Card? I didn’t know much about Fandango. But at least I knew it was the website you could buy movie tickets online. And I thought their gift cards were used online only. For that reason, I assumed that Save Ya would accept e-gift cards for sale. That was a mistake. They need you to send physical gift cards for sale. Cardpool accepts e-gift cards, but payment is 5% less than a payment of physical gift cards sales. 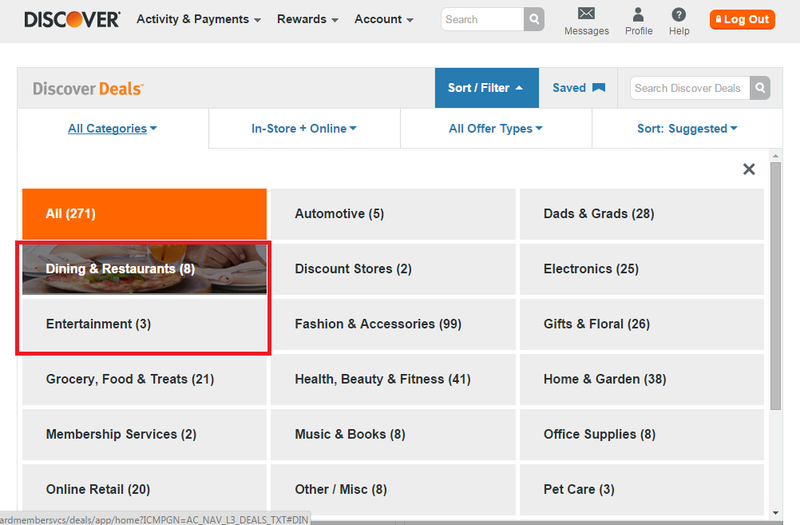 If cash backs from DD and category bonus are posted and then doubled, e-gift cards are like 30% off price. Cardpool offers 70% for Fandango GCs. So, if you buy and sell e-gift cards, you can’t make a profit. If you buy and sell physical gift cards for 75% of face value, you can make a profit although physical gift cards charge a $1.95 fee. So, around 3% will remain in Discover’s reward. There is $1.95 fee per card and no discount even if you order multiple gift cards. I decided to keep $50 e-gift card for myself and order physical gift cards for resell. I ordered five $100 gift cards. The total is $509.75. Fandango has a promotion for GC purchase of $50 or more. For each order, I got one $20 promo code to spend at Shutterfly (one for e-code purchase and one for physical GC purchase, total two promo codes.) I don’t know what they are. I will find out later. All Double Cash Back promo is great, but the timing is bad. It’s the last month of Q2 now, and there is no way to confirm all cash back before Q2 category bonus ends. Since I received an email from Discover Deals, it’s most likely that cash back from DD will be posted. Q2 category bonus remains unknown. But Discover has many discounted gift cards for redemption. I always redeem the reward for Staples GCs, which is 20% discount. Considering this, I won’t lose money even if Q2 category bonus won’t be posted. Discover it card offers 5% cash back on restaurant and movie theater’s purchases of up to $1500 in 2nd quarter (April, May, and June.) The offer will end in a few weeks, and I have earned almost nothing in this quarter. That’s because I don’t spend that much on these categories, and those stores (restaurants and theaters) don’t sell 3rd party gift card. They do sell their own gift cards, but you can buy them with more than 5% discount from eBay, GC Exchange sites, etc. That also means that you can’t sell their gift cards for good prices. So, I haven’t been doing anything for this category bonus. But thing’s changed now, and it may be possible to earn cash back effectively. Discover is now offering “Double All Cash Back” promotion for both new and existing cardholders. They double all cash back you earn for the next 12 billing cycles. Here is the fine print. Double First Year Cash Back:After the first 12 consecutive billing periods that your new account is open, we will double all the cash back rewards you’ve earned and apply them to your account in the next billing cycle. You’ve earned rewards when they have posted to your account by the end of the 12th consecutive billing period. You will not receive Double Cash Back if your account is closed or no longer in the cash back reward program as of the award date. This promotional offer may not be offered in the future. Please note that you need an enrollment over a phone or chat by July 31st if you are an existing cardholder. I did it over chat, and my bonus started on June 12th. Now, rotating category cash back is 10%. However, you can’t expect to sell restaurants gift cards for 90% of face value. You have to accept significantly lower price when you sell. But, what if you can buy gift cards through Discover Deals? A website shows a lot of places you can earn 5% rotating category cash back. There are a lot, and these are not all. Go to Discover Deals. Filter by category. There are only 11 offers, eight restaurants and three entertainment. Among them, there is only one store that offer cashback. It’s Fandango. (The others stores offer either instant savings or statement credit. They won’t be doubled.) Here is the fine print. Offer valid on Fandango Bucks gift certificates only. Offer is not valid in combination with any other offers. Must have cookies enabled on your web browser, link to retailer site from the Discover Deals web page, found at Discover.com/deals or through the Discover mobile app, and use your Discover card for each transaction. Next, go to gift card granny to see if their gift card be sold. Fandango gift cards can be sold to five different GC exchange sites. And Cardpool, Monster gift card, and Save ya offer the highest rate of 75%. It’s a good sign that Save ya offer the highest because they accept e-codes without reducing payment. Cardpool also accepts e-codes but reduce the payment to 70% for Fandango e-code. Fandango sells both physical gift cards and e-codes. 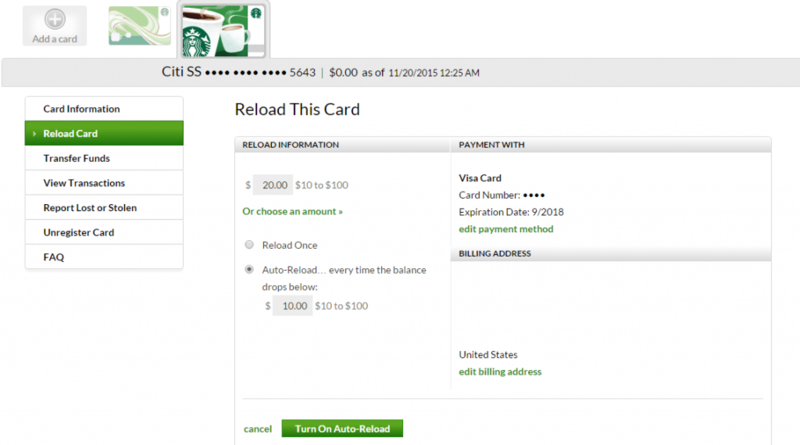 They charge $1.95 fee for physical gift card purchase per card while e-codes has no fee. 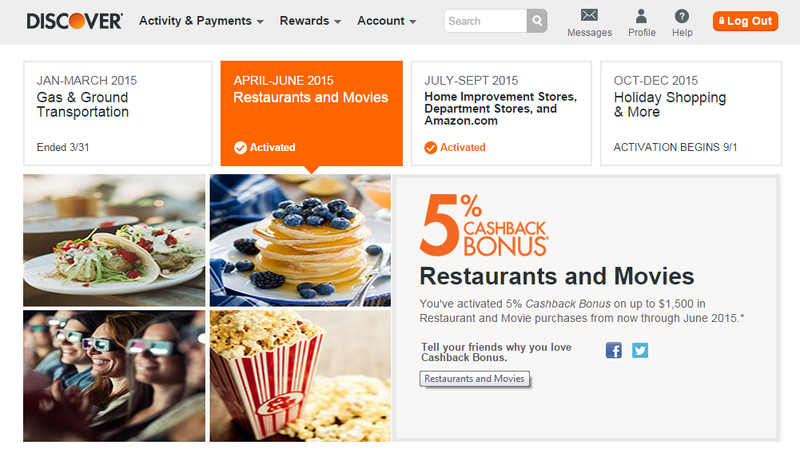 Say you do earn both 5% cash back from category bonus and 10% cash back from Discover Deals. The cash back will be double. So it’s 30% cash back in total. And then, when you sell e-code to Save ya, 5% of total purchase will remain in your pocket. There are some things that are uncertain now. Q1 Will you receive 5% category bonus? Not sure yet. I bought $50 e-code. My order is still pending. Q2 Will you receive 10% Discover Deals cash back? The fine print says, “Offer valid on Fandango Bucks gift certificates only.” Are Fandango Bucks and Fandango gift cards the same things? I tried to find the answer, but I couldn’t find this term in the website. Q3 Will Save ya accept Fandango e-code? I was wrong. Save ya doesn’t accept Fandango e-codes. So, there are few options now. If a purchase of Fandango gift card is qualified for both category bonus and Discover Deals, (5% + 10%) *2=30% cash back will be posted. When you choose e-codes, it breaks even. When you choose physical gift cards, you will earn around 3% profit although you pay $1.95 fee per card. 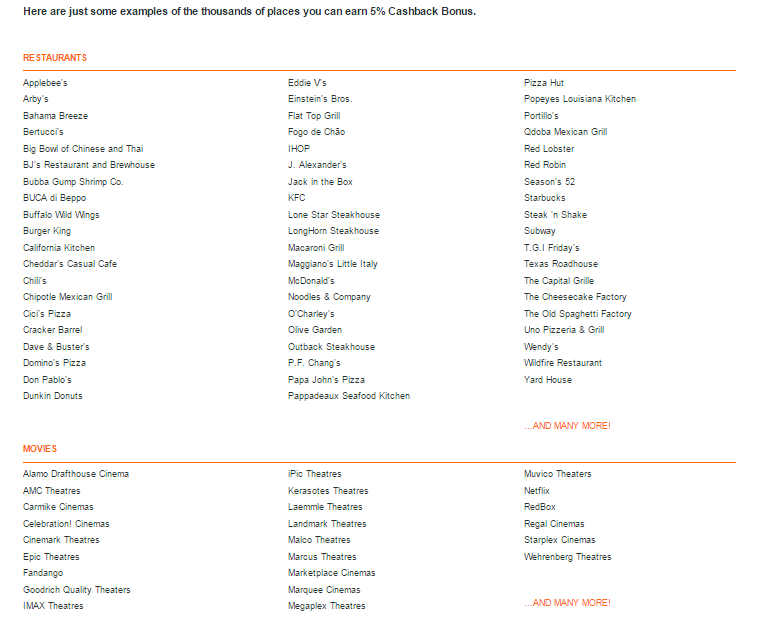 My transaction of Fandango e-code is still pending, and I don’t know whether it is qualified for Discover’s cash back. If either one of them is not qualified, I will just keep the code for a regular spending in the future. You can earn $15 e-gift card of your choice when you spend $50 or more with PayPal Extras MasterCard between May 1st and May 31st. There are five store’s e-gift cards available to choose. Since the email I receive has only three images of gift cards, I almost overlooked. There are Amazon and Omaha Steaks, too. As usual, you will need to activate the offer by clicking a link in the email, prior to purchase. Father’s Day Promo? What happened to Mother’s Day? As you see in the email, it seems like a Father’s Day promotion, which is coming more than a month later. What happened to Mother’s Day, which is coming in a week. Why did they skip? Or maybe I didn’t receive a targeted offer. It’s easy and a great deal. All you need to spend $50 or more in a single transaction. There is no requirement of stores, categories, whatsoever. Don’t forget to activate the offer by clicking a link in the email. 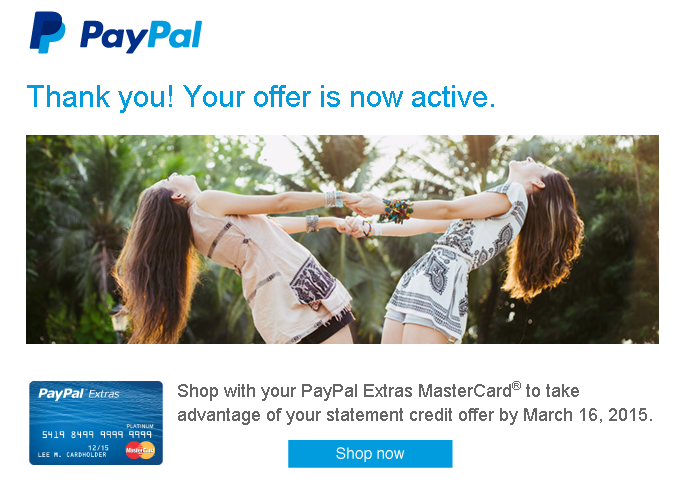 I received a new offer for PayPal Extras MasterCard. A type of offer is an extra bonus point with a purchase. You can earn one extra point for every dollar spent through April 30th. It includes PayPal and eBay purchases. Extra bonus points you can earn through this offer is capped at only 2200 pts. As usual, you need to activate the offer by clicking a link in the email to earn bonus points. This offer is not exciting. Any types of promos that offers extra bonus points aren’t really great. That’s because there is a limit of reward points you can earn in a year (50000 pts.) Besides, a maximum bonus points you can earn through this promo is only 2200 pts. However, the email implies that there will be another offer the following month. I expect the other types of offers for the next one, like statement credit or gift card. 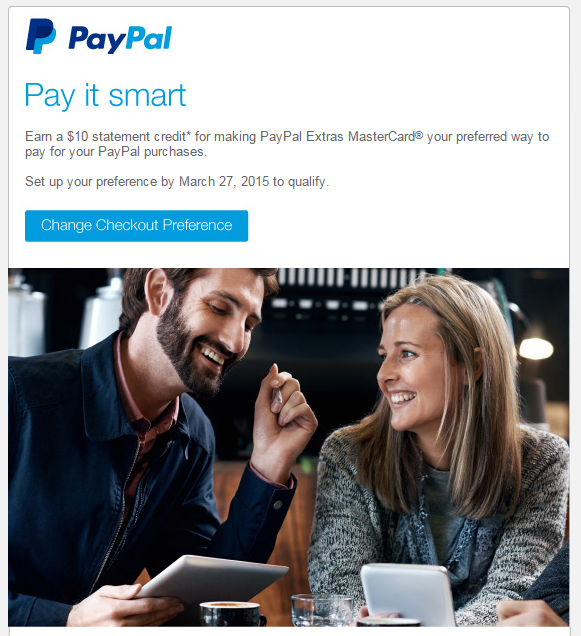 New offer from PayPal Credit Services (PayPal Extras MasterCard) is available. You can earn a $10 statement credit for making PPEMC your preferred way to pay with PayPal by March 27th, 2015. Even after you make PPEMC your preferred way, you can still choose other payment methods. I purchase AmEx gift cards regularly. And every time I receive them, the first thing to do is register and add to my PayPal account, so I can spend down for eBay purchases, shipping for items I sold on eBay, and other PayPal transactions. What if it’s already been a preferred way? Actually, my preferred way had been PPEMC. Even so, I clicked a link in the email and then showed the same page. I clicked three times after that, and it still took me to the same page. So, it probably doesn’t matter which your preferred way was. But you need to click a link in the email to qualify for this offer. Offers of statement credit are better than ones with extra reward points. That’s because PPEMC reward points are limited to 50000 pts per year. Just clicking a link and earning $10 is nice and easy. And remember, usually, PayPal doesn’t send a confirmation email. So, you will need to check the statement to see if the credit will be posted. 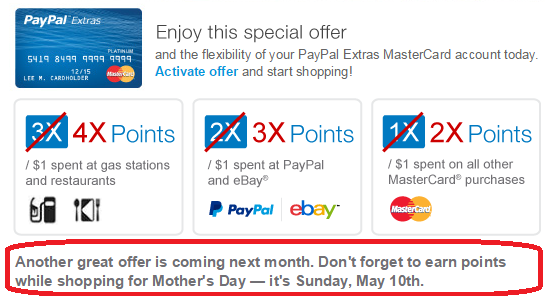 In March, PayPal Extras MasterCard has another special offer. 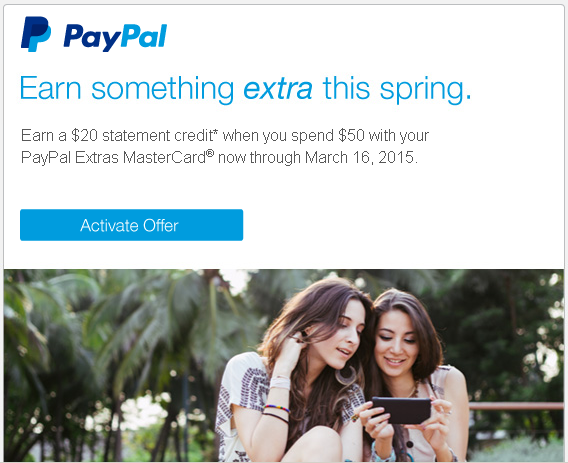 It’s $20 back in statement credit when you spend $50 or more with PayPal Extras MasterCard by March 16th, 2015. Limit one statement credit per card. It doesn’t say that transactions through PayPal are excluded. So, eBay purchase must be eligible. But first, you will need to activate the offer by clicking a link in the email. Last year, I had many special offers and redeemed them. However, because I didn’t keep a record of them, I am not sure if I received all the credit or reward. So, this year, I decided to keep it here, on this blog. Several days ago, I received two statement credits for other offers. One is for this offer, and the other is for the offer from last year. I checked my emails, but they didn’t send any emails to notify me of having posted the statement credit. So, it’s important to keep a record in case you don’t receive the reward. Rate – On average, the rate of reward of PayPal’s offers are better than Amex Offers. For example, the offer I just received is $20 back for $50 spent. It’s 40% back! Easy to redeem – PayPal’s offers don’t specify stores to purchase. It has only minimum spend requirement. Please note that some offers exclude purchases through PayPal. But either way, it’s easier to redeem than Amex Offers. 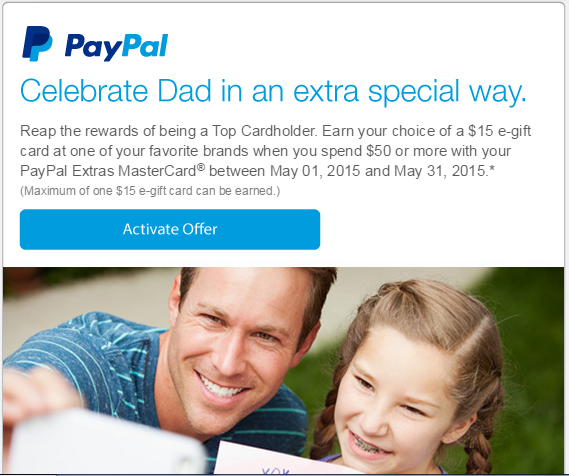 Numbers of offers – PayPal’s offers are much, much less than Amex Offers. Since PP Extras‘ offers don’t specify stores to make a purchase, anyone can redeem for sure. It’s important to check emails periodically in order not to miss the opportunity.